Sometimes all it takes is one tune. One tune and that's it: your life will never be the same again. For schoolmates Laurie Carroll and Stefan Anfield is was Resonant Evil's Renegade Hardware 2003 classic 'Troubleshoot'. The second they heard those haunted chords and sneering, snarling bassline they knew drum & bass was going to be a major force in their life. The shamanic state it left them in even influenced their name: Mind Vortex. Classically trained musicians, Laurie on the clarinet and saxophone, Stef on the piano, the pair both dropped out of their jazz bands the following day. Picking up old bits of hardware and whatever software they could afford, the duo spent the following six years chiselling their craft. Soaking up influences far and wide; soul, jazz, funk and classical were all added to the menu as the pair munched through music, digging deep to understand what made certain tracks so powerful and all the best hooks come with that tangible sense of magic. 2009: research and development over, they were confident they had a sound sharp enough to unleash. They wrote a wishlist of labels they wanted to work with. Ram was top of that list, so they picked up the phone. The rest is D&B history! 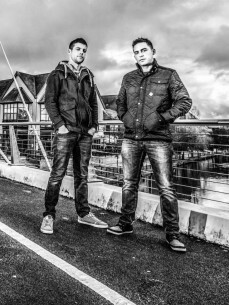 Ram instantly recognised Laurie and Stefan's talents and, after a debut on Plush Recordings, signed them exclusively. 'Now It's Time' and 'Onslaught' were the first signs of Mind Vortex's presence on Ram. Debuted on Andy C's critically acclaimed 'Nightlife 5' mix, they instantly reflected the duos understanding of the wider extremities of drum & bass science. While 'Now It's Time' showed a knack for funky hooks and well executed vocal work, 'Onslaught' proved the pair had just as much knowledge of the darkside with its unrelenting bass texture and cunning sense of classical drama. Their debut Ram single 'Hotbox' followed and quickly cemented them as one of drum & bass's most exciting new acts. Whipping up bonafide hype from January 2012 onward, it dominated the drum & bass charts at both BBC 1Xtra and Beatport, gradually tearing a hole out of the entire year. Still widely regarded by many DJs as one of THE tunes of the year, it struck the perfect balance of vibrant, chart-alluring hooks and outrageously raucous bottom end. Naturally the year ended with a fitting climax; their slamming mix on Ram's Drum & Bass Annual 2012 went straight to number one in the iTunes dance chart. With fans such as Zane Lowe, Mistajam, Grooverider, Bailey, Crissy Criss, DJ Hype and Drumsound and weekly DJ appearances across Europe, Australia and the US, Mind Vortex remain hot property as we look into the future. 2013 will see more exciting new material including new single 'Alive / Arc'; yet another devastating double header that exemplifies their wide range as producers, 'Alive' is rare moment of song-written drum & bass beauty while 'Arc' slams us back into the same bass-bashed casualties that 'Hotbox' caused.And there's plenty more to follow. With a water-tight production regime, no time is wasted between the duo; both know when it's right for the other to take the lead as they bounce exciting ideas back and forth until they're honed and polished to production perfection, And ready to influence the next generation. Just like Resonant Evil did with them exactly 10 years ago.